For every texture that includes a transparent detail, that texture needs to have an additional black and white texture that is the exact same dimension as the original. This additional texture depicts black areas as completely transparent, white areas as completely opaque, and variations of gray as levels of transparency. Opacity Maps are perfect if you are trying to create a translucent surface, like water, clouds, or frosted glass. They are also great for creating the fine details of clothing or hair products because it allows for more complexity on the edge of a surface that would not be possible by 3D geometry alone. 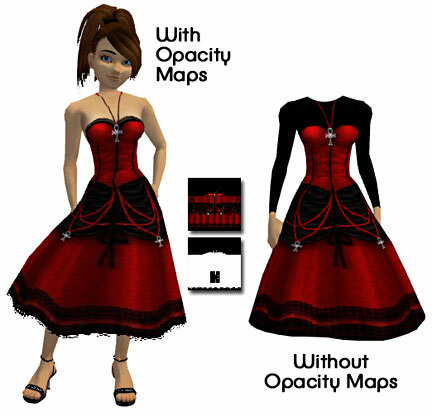 In the example below, you can see how Developer TNT uses Opacity Maps to add detail to your Helena Dress. Note the exposed shoulders above the corset, the necklace, and the fringe around the hem. This is a perfect example of how an Opacity Map can add complexity to an otherwise simple outfit. You will find there will be occasions when overlapping two textures, each containing Opacity Maps, can cause the furthest texture to disappear. 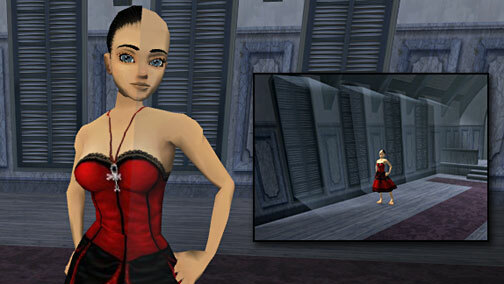 This is an artifact of the way the IMVU client renders textures and geometry in 3D. This is most likely to happen when a hairstyle or clothing contains an Opacity Map and is viewed through a window that also contains an Opacity Map. The effect is that both the hair and clothing “may” disappear. In the above example the avatar is standing at the intersection of a Opacity Map designed to create the illusion of shafts of light leaking through closed shutters. 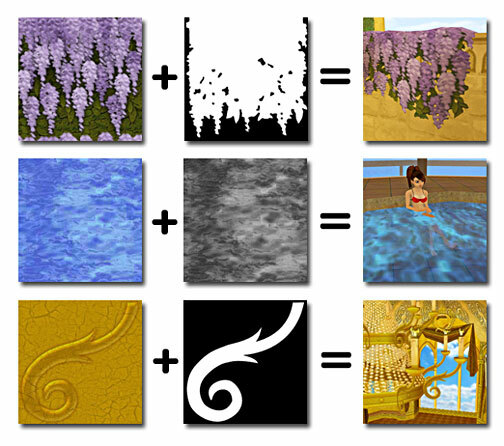 As you can see, the avatar’s hair and skin textures disappear when viewed through the multiple Opacity Maps. What is interesting is that the dress did not disappear. It is impossible to foresee every time this might happen, but it is worth keeping in mind while you design your products. EZ Tee – Create a Shirt in Minutes!